Digital Foundry's final assessment of 343 Industries' mammoth remastering effort. Halo: The Master Chief Collection is just hitting stores now and while we've already served up some in-depth impressions, it's fair to say that the sheer scale and scope of the project means that there's still a lot of specific detail we want to share with you about the game. Perhaps more than most other remaster projects we've played, The Master Chief Collection stands as an incredibly ambitious project, consisting of multiple game engines designed across multiple generations by many different teams. Bringing it all together into one solid package is clearly an undertaking of epic proportions - and while it's not (and probably never could be) the ultimate compilation that will please every fan, the bottom line is that the end result works very well. Just getting so much content immediately accessible is an accomplishment in itself. The connective tissue in all this is its central menu system. Failing to organise so much content could have resulted in a frustrating experience, particularly when dealing with the game's 110 multiplayer maps, but the end results are excellent. 343 has broken up each game into campaign, competitive, and challenge menus while tucking the rest of the features away behind the extras and options menu, and it's easy to customise the game to your liking with global and per-game settings available. It's all backed by the unforgettable Halo soundtrack, seamlessly transitioning between tracks depending on the game highlighted by your cursor. If there's one issue with the presentation between all four games, however, it's the move to completely static loading screens. The Master Chief Collection lacks the stylish, animated loading screens of Bungie's titles and in the process, something is lost. Still, for the most part, the team at 343 has done an excellent job wrangling all of this content into something coherent, something that works. However, with each game developed individually with many different studios involved, we think that every title in the collection deserves its own critique. While we could produce complete articles on every single game in the pack, hopefully the format we've chosen for this piece lays out the plus and the minus points of each component Master Chief outing in a simple, easy-to-absorb manner. Gallery: Split-screen performance is an element of The Master Chief Collection that many people have asked us to investigate - here are some results. All of the games have issues here owing to highly variable frame-rates, which is a little disappointing. As the original game in the Halo franchise, Halo: Combat Evolved also comes with the most baggage - it's nearly 14 years old and has been ported several times over with varying degrees of success. In fact, the version of Halo included in The Master Chief Collection is actually a port of a port - Saber Interactive's Halo Anniversary for Xbox 360 converted over to the Xbox One. It seems like a straightforward enough project, but it's clear that the team has encountered a few problems along the way, resulting in a remaster that isn't all it could have been. We still enjoyed reliving the original Halo experience, however, and most importantly the core elements of the original Halo have been carried over successfully. 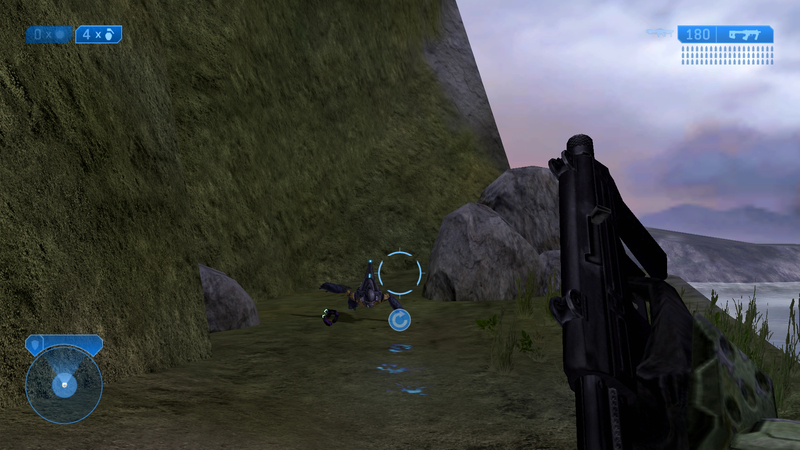 Image quality: It's Halo Combat Evolved at 1080p. Unlike Halo 2 Anniversary, both the classic and Anniversary modes have been upgraded to support full 1080p and they look smashing. Assets haven't received any additional improvements over the Xbox 360 version of the game, of course, but it looks and runs much better than it did on either of Microsoft's previous consoles. Crucially, the classic multiplayer maps, including the full set of PC-exclusive maps, have made their way into the collection and are playable online. It's as complete a collection of Halo: Combat Evolved as one could hope for. It's Halo: From Halo 2 onwards, Bungie moved to a Havoc solution for physics simulation, but Halo CE used an in-house solution that fans adore. When you smash two warthogs together in Blood Gulch you expect them to fly off of one another in just the right way and, thankfully, that's absolutely the case here. While sticking with the original engine may have introduced some development issues along the way, it was the right choice when it comes to delivering the real Halo experience. The original multiplayer: The fact that multiplayer is now available on the original maps with the original game engine is the crucial piece of the puzzle that was missing in the 360 Anniversary release, and it's excellent. 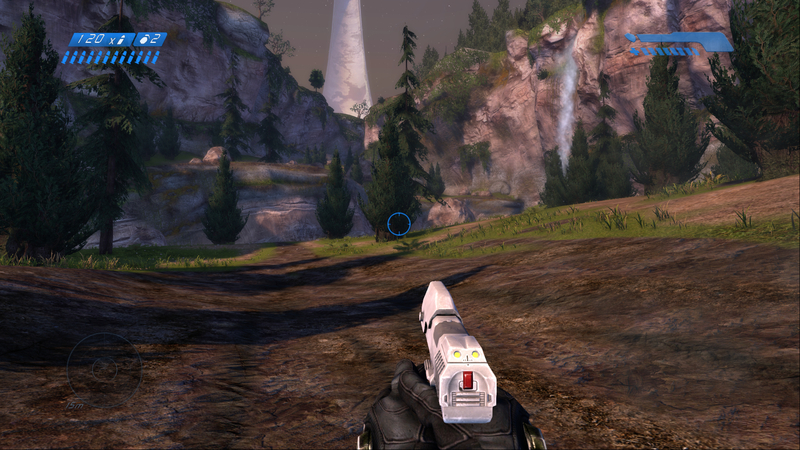 Many were bitterly disappointed when it was announced that Halo Anniversary contained a set of Halo 1 maps created in the Reach engine, but that has been fully rectified here. They look and play just like you remember - but this time without resorting to XBConnect. Performance analysis - A look at the performance of Halo Anniversary utilising the updated visuals created by Saber Interactive. No more selected levels - now we can show you exactly what we want. Note that all the videos on this page are presented at 60fps. Use Google Chrome and select 720p or 1080p resolution to unlock the additional temporal resolution. 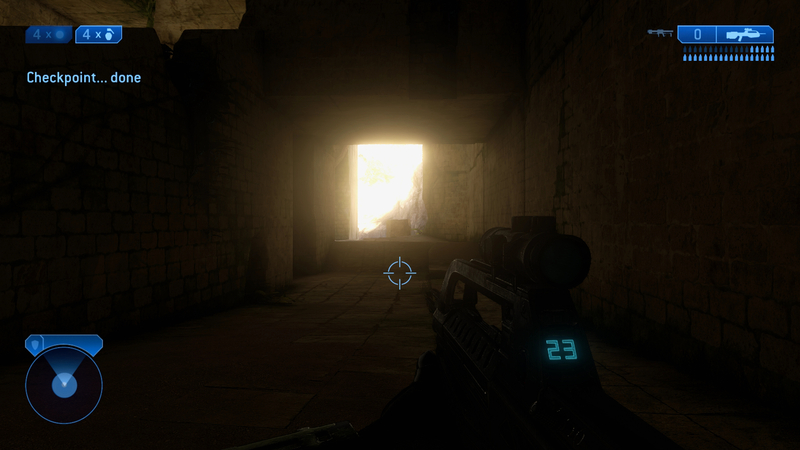 Frame-rate: Despite its improvements, Halo Anniversary is actually the least polished title in the package. While all four of the games suffer from performance dips to some degree, the average frame-rate in Halo Anniversary is lower than the rest. Screen tear and frame-rate drops are the name of the game here and the end result is distracting at times. It's never unplayable, but it's never optimal either. If you're planning to stick with the classic mode, however, you won't have many problems as it manages to hold its target for the vast majority of the time. Split-screen performance: Halo CE multiplayer was built on split-screen and it's how many people played it originally. This feature is thankfully maintained here, but it doesn't work as well as one might hope. In classic mode, performance is mostly acceptable with a slightly unstable 60fps, but in Anniversary mode it can become downright choppy. Frame-rate dips below 30fps occur regularly with torn frames appearing primarily along the top half of the screen (sorry, player one). It feels jittery and difficult to enjoy when using this mode and we'd have to recommend sticking to classic visuals if that's how you want to play. At least it uses a rather wide field of view that doesn't restrict either players' viewpoint. Legacy animation: The animation created for Halo CE was key-framed at 30fps but, thankfully, Saber has managed to re-work most of the important animation to operate at a full 60fps. Unfortunately that doesn't apply to everything. Particle effects still operate at a lower rate, resulting in some jerky-looking combat scenarios as 30fps plasma bursts shoot across the screen. Cut-scene animation too is impacted by this, leaving the cinematic sequences looking pretty poor. It's probably fair to say these limitations were necessitated by the strict adherence to the original Halo physics. While ugly, it's probably the right choice in the end if only to retain the original gameplay. Classic mode limitations: We're sure the updated artwork has its fans but we definitely prefer the look of Bungie's original assets. Disappointingly, aside from the higher resolution and frame-rate, no additional enhancements were made. Classic Halo completely lacks anti-aliasing and makes limited use of anisotropic filtering. You could argue that the classic mode is meant to more closely represent the original experience, but Halo CE was never designed to be played at such a high resolution in the first place and older CRT televisions hid many of the flaws that are now obvious. Lack of Halo CE multiplayer playlist: Matchmaking is an integral part of the Halo multiplayer experience, but, at launch, there won't be any playlists dedicated to Halo CE. It's still possible to play on the original maps but they're jumbled in with the more generic map lists instead. 3DTV support: Support for 3D isn't exactly popular these days especially with the superior VR solutions trickling out, but the Xbox 360 version of Anniversary featured a surprisingly excellent implementation that we're disappointed to see missing. Rather than expand on the feature, it's simply cut altogether. One of the issues with Anniversary is the complete change in mood as a result of colour and lighting. You can argue that it no longer looks and feels like Halo. Though, in classic mode, the lack of AF does hurt texture detail. 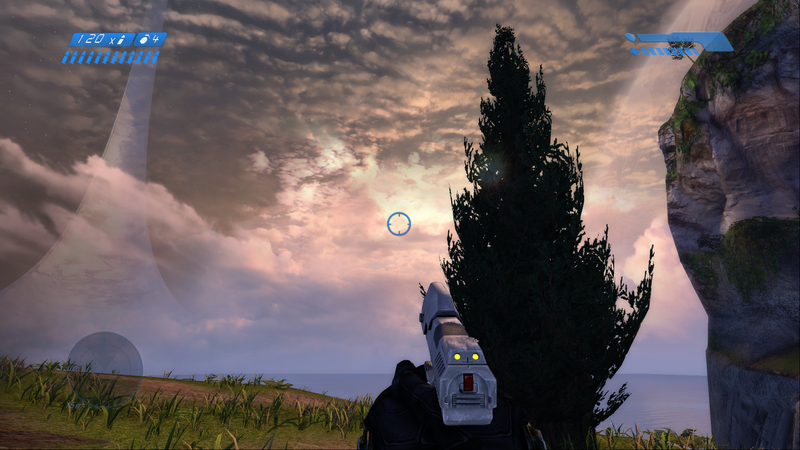 The classic sun filtering through the trees was one of those effects that sold Xbox systems back in 2001. The fact that such an iconic visual effect is missing in Anniversary remains a mystery. The excellent per-pixel lighting of Halo 1 still looks nice today but the changes to the core artwork are less appealing. Forerunner structures that were intended to be simple and sleek sometimes appear overly busy in the remaster. 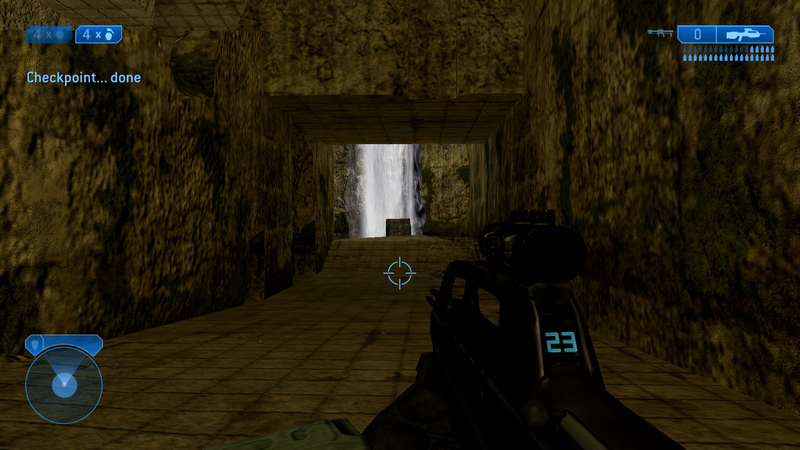 With a little anti-aliasing Halo 1 could have looked a lot better in classic mode. Still, there are instances where AF appears to be in use allowing for increased texture detail. It's a shame this isn't the case throughout. We've already taken an extended look at the excellent remastering of Halo 2, but coverage of The Master Chief Collection as a complete package wouldn't be complete without its inclusion. We were quite impressed with the work done on this project and feel that it is the most impressive piece in the collection. Unlike the original Anniversary, the new art created for Halo 2 feels much more in line with Bungie's original assets, which - by the way - haven't held up particularly well. Delivering fairly solid performance, beautifully remastered visuals and audio, and the Halo 2 gameplay you expect, Halo 2 Anniversary is a success. Remastering done right: Halo 2 Anniversary is incredibly faithful to the original gameplay, but this time around, the updated artwork also feels more in line with Bungie's original designs. The game looks beautiful and runs well. Shadows: Halo 2 was initially designed with the idea that objects could cast and receive shadows but this was eliminated due to lack of horsepower. Halo 2 Anniversary makes this a reality and gives the game world the depth it could have used in the first place. It makes a big difference in the presentation and the fact that even particles receive shadows goes a long way towards making a cohesive presentation. Audio design: It's not only the visuals that have received an overhaul. Halo 2's entire soundscape has been re-crafted for this remaster and the results are generally quite good. What really makes this work, though, is the fact that jumping back to classic mode switches to the original Xbox audio allowing you to both see and hear the difference. While it would have been nice to mix and match the audio mixes, it's still a great feature. CG cut-scenes: While we tend to prefer cut-scenes of the real-time variety, the inclusion of high-end rendered cinematics is pretty interesting in its own right. Seeing the story sequences of Halo 2 brought to life at such high quality is excellent for any fan of the series. The inclusion of the original Xbox's real-time sequences is also a nice bonus. Another look at the performance of Halo 2 Anniversary, as originally published in our tech analysis last weekend. Split-screen performance: As with Halo CE, the split-screen frame-rate in Halo 2 is rather poor. In Anniversary mode we found performance improved on average compared to Halo CE but it never really feels particularly smooth. Unfortunately, the classic mode also suffers from performance issues this time meaning that there's no way to enjoy a full 60fps split-screen mode with Halo 2. It should also be noted that, while the field of view is wider than the original Xbox game, it still feels somewhat narrow compared to Halo CE Anniversary. Image quality: 1328x1080. It's not a bad compromise, but it's also still not as sharp as proper 1080p. While we definitely believe that trading resolution for frame-rate is always the right choice, it's still disappointing that we weren't able to enjoy the new assets at a full 1080p. While it's all just conjecture, one can't help but wonder if making the classic mode an optional bonus could have given them the oomph necessary to reach that target. Additional loading screens: Halo 2 was designed to be a seamless experience on the original Xbox, so we were pretty surprised and a touch disappointed that this aspect of the game has been lost. Transitions between each chapter are now divided by a rather lengthy, static load screen that loses some of the fluidity of the original experience. It's fair to assume that the greater variety of assets put the kibosh on this feature, but that doesn't make it any less disappointing. The amount of geometry and detail added to each scene in the Anniversary mode is really quite striking. 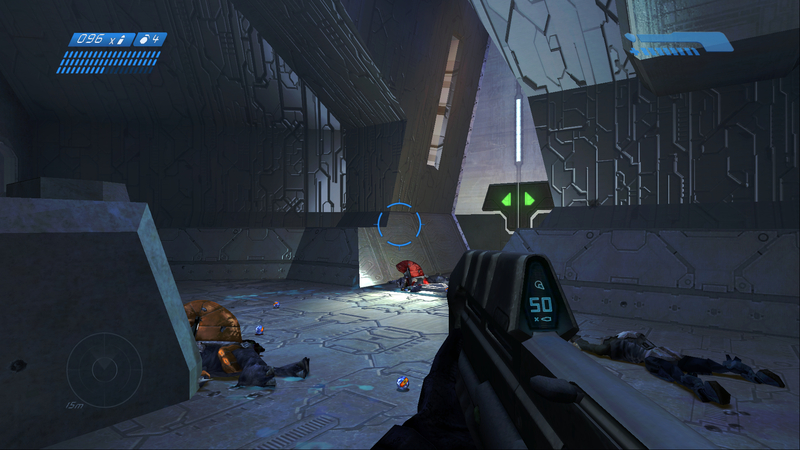 Most importantly, the colour scheme is reasonably well preserved and still looks and feels like Halo 2. High dynamic range lighting has a dramatic impact on the presentation with transitions between interior and exterior taking on an entirely new appearance. 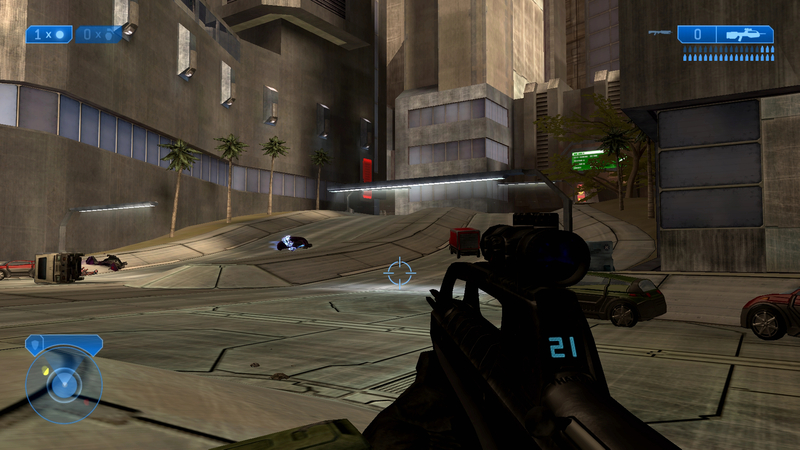 The original Halo 2 featured some pretty ugly locations with lots of flat, brown walls. Replacing those with more detail in Anniversary helps bring the world to life without losing the original feel. Ambient lighting creates a more captivating world. While Halo 1 Anniversary was often overly bright, Halo 2 makes a better use of its upgrades to create some lovely moments. Halo 3 marks the series' first outing on the Xbox 360 and stands as one of the most ambitious titles of its day. Bungie introduced its next-generation renderer, with Halo 3 using two 1152x640 frame buffers to more accurately simulate high quality HDR lighting, to breathtaking effect. 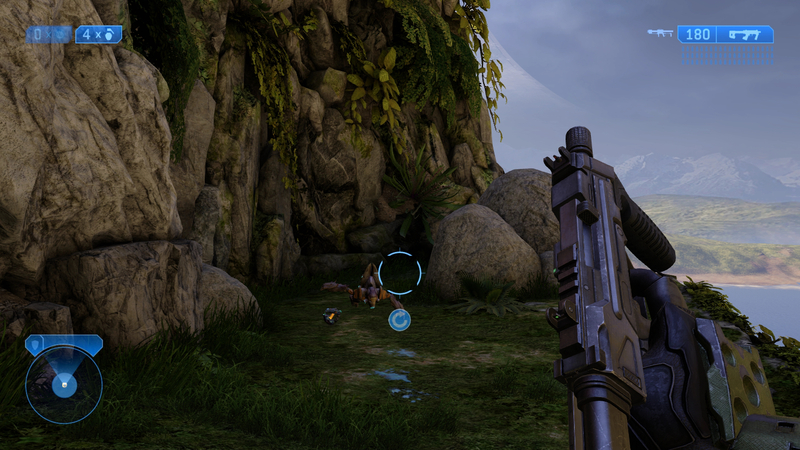 The studio also introduced Forge mode for the first time in addition to the in-game DVR functions. The feature set was vast and impressive but the game was never quite perfect on the performance and image quality side. A low resolution in combination with minor frame-rate troubles ultimately kept the game from feeling as polished as it could have been. This was also the game that left people wondering whether or not Bungie could model the human face properly. Still, it's an amazing Halo experience and it's fantastic to finally have an enhanced version of the title available. 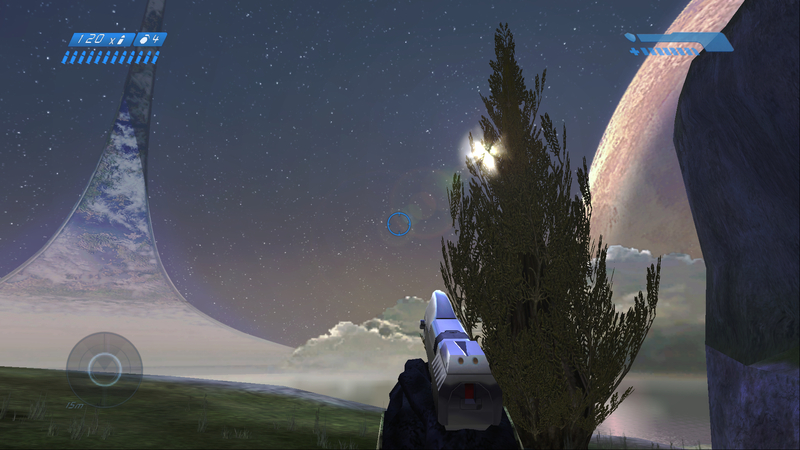 Image quality: Halo 3 benefits tremendously from its Xbox One conversion. The sub-720p, no AA original game has been bumped up to a full 1920x1080 with FXAA resulting in a much more attractive experience. It makes a world of difference and dramatically improves the somewhat chunky visuals of the original 360 release. Frame-rate: Halo 3 delivers a smooth 60fps and, more than any other game in this collection, holds it the vast majority of the time. Halo 3 on the 360 ran at 30fps but suffered from noticeable frame-pacing issues that prevented it from ever feeling completely stable, and this too has been eliminated. The one exception seems to be the beach landing in 'The Covenant' mission, where frame-rate drops into 50fps territory or worse. Motion blur: Halo 3 is also the only game in this collection to make use of any form of motion blur and it looks pretty good. While not as crucial at 60fps, motion blur definitely improves the fluidity of the experience. It was always present in the 360 original but it's disappointing that it hasn't been implemented elsewhere - like in the sequel, for example. 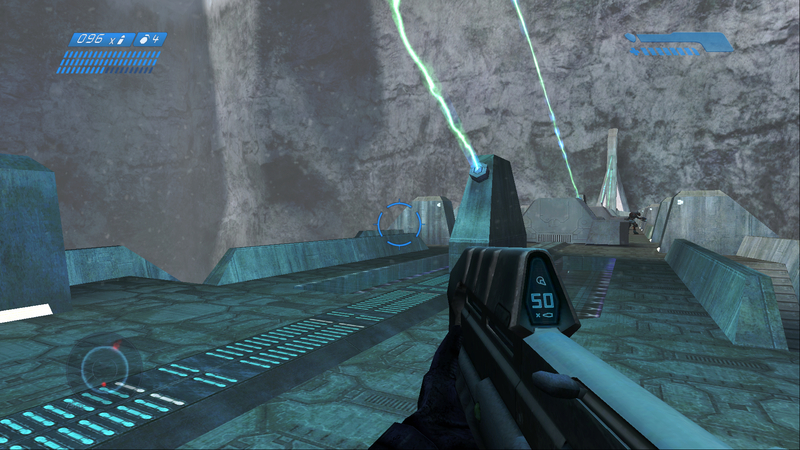 Halo 3 in single-player mode. Performance isn't flawless in all instances but it's generally quite stable and the result is an extremely satisfying gameplay experience. No additional enhancements: This is a no-frills port of Halo 3 that makes no attempt to address some of the issues with the original game. Foliage and scenery detail features an aggressive LOD system that becomes more distracting at a higher resolution and we would have liked to see these details pushed out a bit. Additional modern rendering techniques, such as ambient occlusion, would also have made a world of difference, especially with the indoor sequences. Font scaling: The team at Ruffian hasn't made any changes to the game's HUD or fonts. As a result the original fonts designed for 720p are simply upscaled to 1080p with a basic, lacklustre filter applied. We can understand the lack of new assets elsewhere but an improved set of fonts by itself would have made a big difference. Split-screen performance: Yup, it's an issue here as well. Fortunately, Halo 3 runs better than any of the other games in split-screen mode, providing a fairly solid 60fps experience. 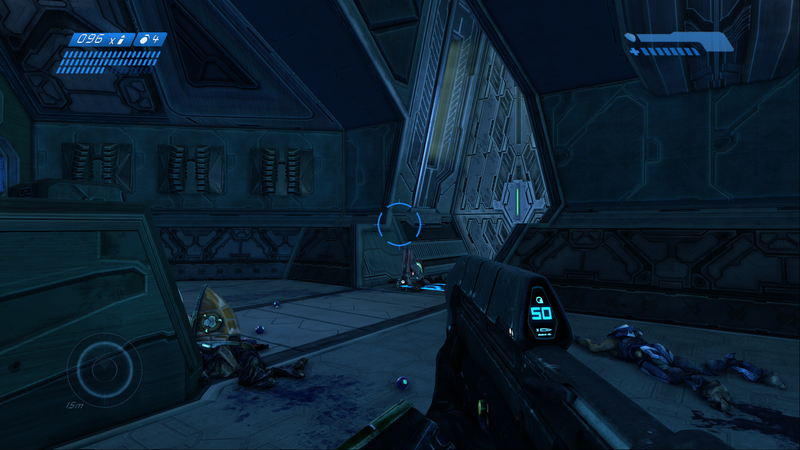 There are definitely dips, especially in The Covenant mission, but it's very playable. 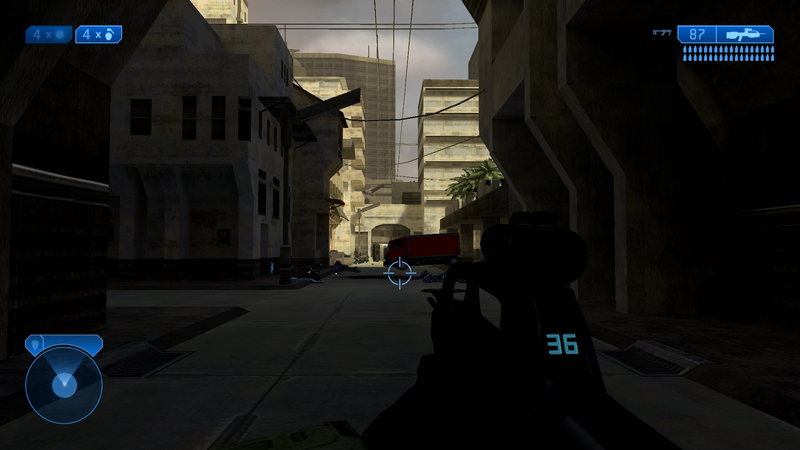 The game uses the same settings as the original 360 version in this mode, however, with black bars filling the left and right of the image, creating smaller playable windows for each player. Furthermore, the level of detail is pared back, resulting in grass and objects that pop-in around the players' feet during gameplay. Lack of anisotropic filtering: Halo 3 makes use of flat, open areas that would have benefitted tremendously from a bit of AF. Texture work is compromised greatly by the lack of it and results in lost texture detail throughout. 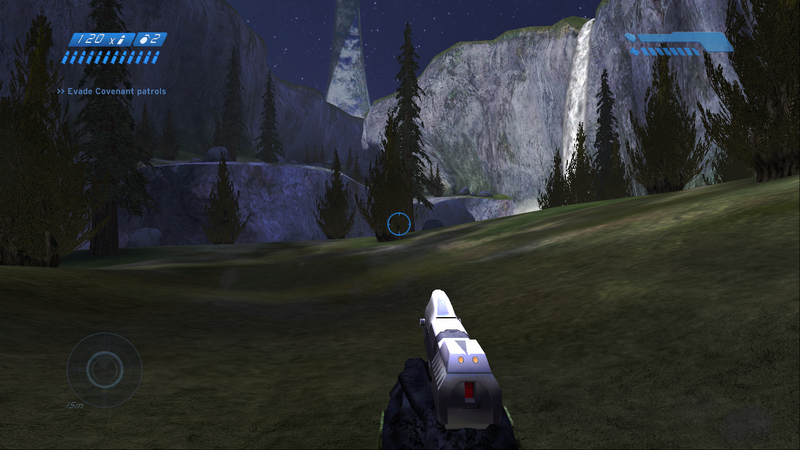 Without dense foliage or other details to help cover the terrain, many of the hills and structures of Halo 3 wind up looking less detailed than they otherwise could have as a result. Halo 4 stands as perhaps the single most impressive technical showpiece on the Xbox 360. 343 Industries were given a massive budget and plenty of time to create a game that pushed the visual envelope of the system while attempting to adhere to Halo's penchant for large maps. Halo 4 is an interesting piece of the collection as it represents an attempt at porting one of the most technically advanced 360 titles to a new console - not unlike Naughty Dog's attempts with The Last of Us Remastered. Unfortunately, Ruffian wasn't quite as successful as the Dogs, and Halo 4 on Xbox One suffers from a few problems. Image quality: Halo 4 already featured excellent image quality on the 360 and the bump up to full 1080p elevates it further. This improvement really helps reveal how impressively detailed the game's assets originally were. Visual quality was high enough that the Halo 4 engine actually served as the basis on which the Halo 2 Anniversary multiplayer maps were built. One cutback sees the water animation completely absent - a shame, especially bearing in mind that this was already pared back in the original Xbox 360 title compared to Halo 3. Cut-scene quality: It cannot be stressed enough - the real-time cinematic sequences in Halo 4 are stunning. While there's certainly more that could be done to improve the overall look even further, such as sub-surface scattering for human faces, the end result is still impressive and, thankfully, most of these scenes run at a smooth 60fps. 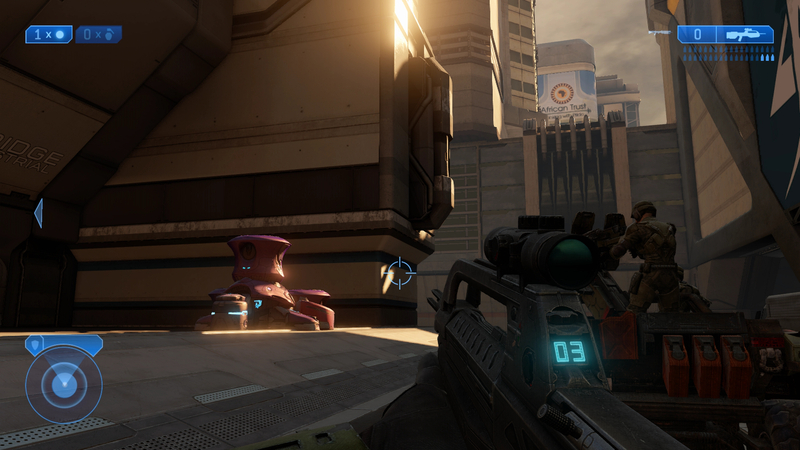 Short loading times: Jumping from Halo 2 Anniversary, the difference is pretty dramatic. It doesn't take long to jump into a Halo 4 mission and, after bouncing between different games so regularly, this is quite welcome. Potentially the best candidate for remastering onto Xbox One, Halo 4 shows enormous promise in terms of its visual presentation, but the frame-rate issues are just too intrusive overall for our tastes. Frame-rate: Halo 4 aims for 60fps, as with the rest of the package, but fails to deliver a consistent experience. The game appears to struggle in two different areas - decompressing data while entering a new area and simply handling the load of heavy combat. Nearly any time the player walks into a new, large arena, the game engine seems to buckle under load, resulting in substantial frame-rate dips all the way to the 30s. These drops can persist for upwards of 20-30 seconds and definitely impact the initial moments of many battles. Even once that has settled, the performance often struggles to maintain a stable 60fps, producing frame-rates in the 50s pretty regularly. There are times when the game feels just perfect, of course, but these dips occur far too regularly for our liking, and there's the feeling that what could have been a stunning Xbox One conversion just feels a touch too unpolished. 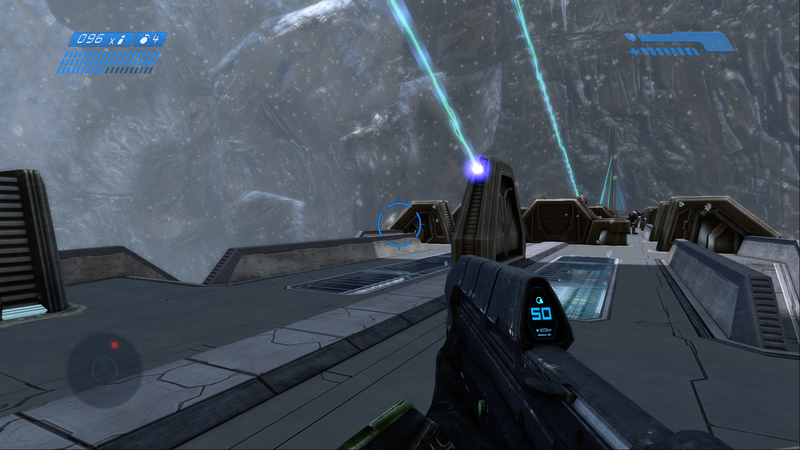 Obtrusive HUD and font scaling: Similar to Halo 3, Ruffian Games hasn't updated the HUD or font elements for Halo 4 resulting in unattractive scaling. 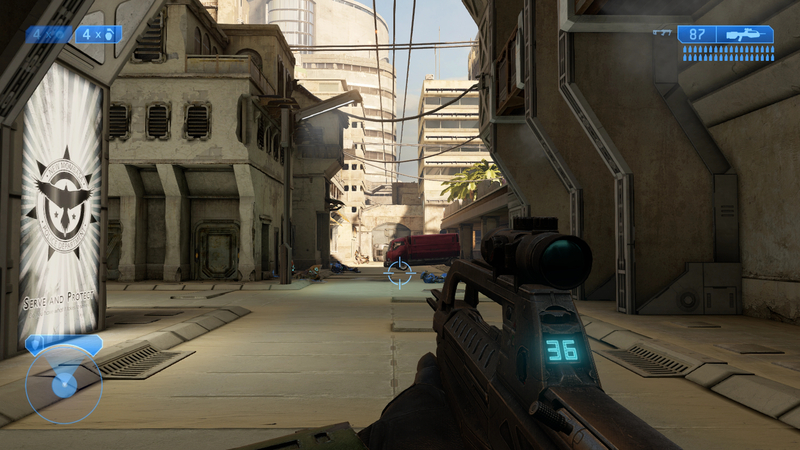 The HUD itself is also overly distracting, especially when played back-to-back with earlier Halo games. Superimposing Master Chief's helmet lining along the edges of the screen doesn't really add anything to the experience and ultimately just gets in the way. Coupled with the HUD scaling issue, the results aren't great. Split-screen performance: We're saving the worst for last here. The frame-rate in Halo 4 split-screen is bad to the point that we'd argue that it's not really playable. Moments where dips occurred in single-player are much worse here, but even those sections that were reasonably smooth fail to come close to reaching a solid 60fps. The most jarring issue here, however, is the insanely aggressive LOD system. Assets are drawn in as the player moves through the world but sometimes that leaves huge sections of the map without any texture detail at all - remarkably, there are times where you'll wind up fighting the Covenant against a backdrop of flat-shaded polygons. This is certainly a legacy issue related to the 360 version, though performance is bad enough in this mode that one has to wonder how it would have run without the aggressive LOD system. There's so much that 343 does right in The Master Chief Collection. The sheer scale of the project is breathtaking, the easy access to all elements of the Master Chief timeline is exceptionally well handled but most importantly, the classic gameplay across all titles still holds up. Quality varies from game to game, but the overall value proposition is remarkable - indeed, just Halo 2 Anniversary on its own is a great piece of work. Factor in the three additional games and the colossal array of online options and the package looks simply irresistible. 343's stated aim of targeting 60fps gameplay is instrumental in elevating these games over their original releases on older hardware. However, when it comes to performance, things are pretty clear-cut - aside from the classic modes in the first two Halo games, it's Halo 3 that offers the smoothest performance in the package. It delivers a near constant 60fps throughout most of the campaign and in multiplayer. Halo 2 Anniversary fares well enough in this respect as well, but Halo Anniversary and Halo 4 simply can't sustain the 60fps target with the kind of consistency we'd like, to they point that they would probably benefit from an optional 30fps cap. One of the biggest disappointments in the package comes down to split-screen. Performance is much worse across the board with all four games, with only Halo 1 Classic and Halo 3 managing to deliver anything close to a stable 60fps. We only had the chance to test two player split-screen mode, unfortunately, but the signs don't look good for three- and four-player multiplayer.